Disk images are computer files in Windows 10 that contain all the content and structure of a storage device, such as a hard drive, CD, DVD, Blu-Ray, or USB flash drive. A disk image is a single file that faithfully reproduces all the contents and capabilities of the storage device that it’s cloning. Think of a disk image as a clone of a DVD or some other device turned into a single file on your computer. Navigate to the ISO file that you want to mount. Double-click the file to mount it in File Explorer. File Explorer displays the contents of the ISO file. View the contents of the ISO file and copy and paste any files that you want to use on your computer, as you normally do. The contents of an ISO file that is mounted in File Explorer. After you mount an ISO file, its contents are shown as a separate drive in File Explorer until you eject the ISO file. During the time it’s mounted in File Explorer, you can’t edit the ISO file, nor can you delete it or change its location. In File Explorer, click the This PC section. 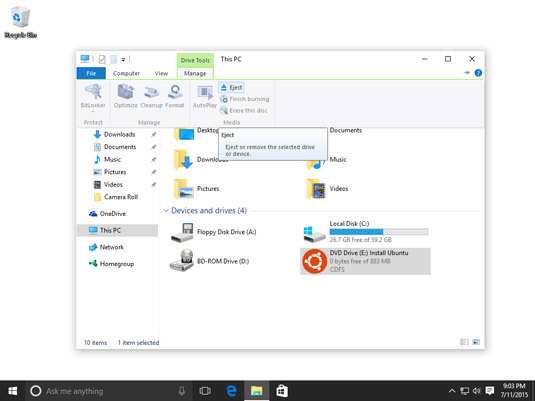 In the Devices and Drives section, select the drive with the contents of the mounted ISO file by clicking on it. Click the Manage tab on the Ribbon. In the Media section, click Eject. The drive with the contents of the mounted ISO file no longer appears in your list of Devices and Drives. 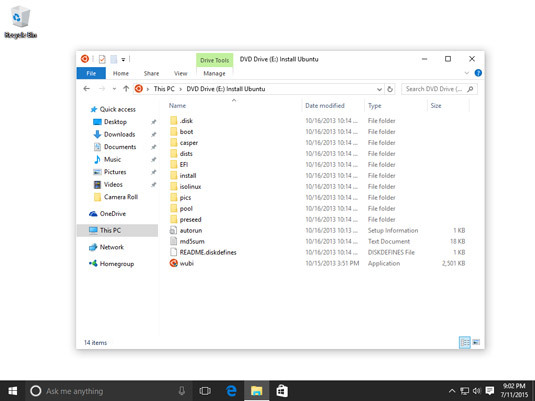 Shows the Manage tab on the File Explorer Ribbon. You can achieve the same effect by right-clicking the drive in the Devices and Drives section and selecting Eject.